With that bold and perhaps unlikely prediction, Trump pledged that improved forest management practices will diminish future risks. The declaration evoked his initial tweeted reaction to the fire, the worst in the state’s history, in which he seemed to blame local officials and threatened to take away federal funding. 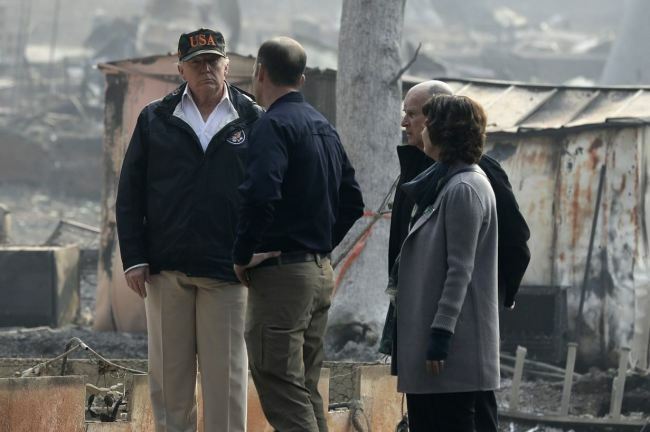 Hours later and hundreds of miles to the south, Trump found similar signs of devastation in the seaside conclave of Malibu, one of the areas of Southern California ravaged by wildfires. Palm trees stood scorched and some homes were burned to the ground on a bluff overlooking the Pacific Ocean. For Trump, it was a day to comfort a state grieving from twin tragedies, wildfires in Northern and Southern California as well as a mass shooting Nov. 7 at a popular college bar north of Los Angeles. Trump said he would meet with people impacted by the shooting at the Borderline Bar & Grill in Thousand Oaks before returning to Washington. The meeting was expected to be closed to reporters. Wearing a camouflage “USA” hat, Trump gazed solemnly at the devastation in Paradise. “It’s going to work out well, but right now we want to take of the people that are so badly hurt,” Trump said visiting what remained of the Skyway Villa Mobile Home and RV Park. He noted “there are areas you can’t even get to them yet” and the sheer number of people unaccounted for. “I think people have to see this really to understand it,” Trump said. “They’re out there fighting and they’re fighting like hell,” Trump said of the first responders. He pledged that Washington would do its part by coming to the Golden State’s aid and urged the House’s Republican leader, Rep. Kevin McCarthy of California, a Trump ally and frequent White House visitor, to “come to the office” to help secure the needed funding. After the negative reaction to his response, Trump shifted gears, expressing words of encouragement to first responders and those of sympathy for hit victims. Brown, a fierce advocate of addressing climate change, pointed to several causes and they need to deal with them.